One of the most iconic and largest cruise ships in the world begins its 25-day multi million pound dry dock. 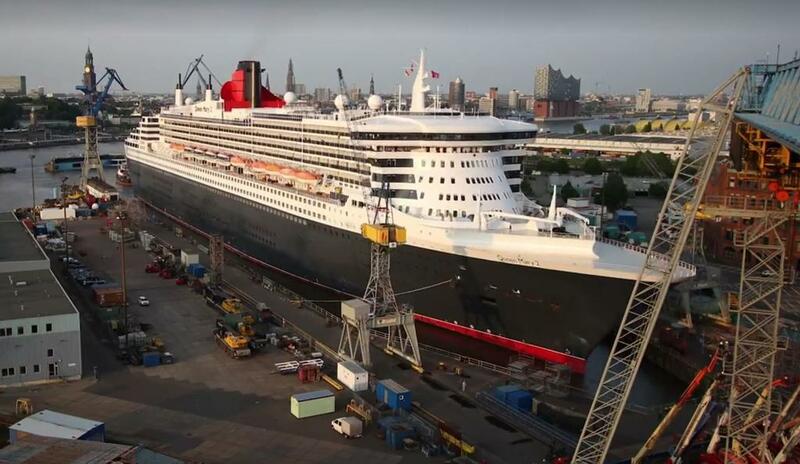 Queen Mary 2 which is operated by UK-based Cunard Line arrived in Hamburg, Germany on May 27 to begin all the much-anticipated upgrades. The 150,000 gross ton vessel will be receiving a ton of upgrades and new features at the Blohm+Voss Shipyard in Hamburg. The 25-day refurbishment will be complete by June 21, 2016. Cruise Hive has reported on upcoming features for the ship for months. Some highlights include a redesigned Carinthia Lounge, new Verandah Restaurant, 15 new single cabins, an extra 30 Britannia Club cabins, expanded kennels, new signature colour schemes, new carpets, new furniture as well as more decorative fixtures and fittings all around the vessel. In addition to all the interior enhancements the ship will be getting a fresh new paint job and new technical upgrades. The first guests able to experience the new look Queen Mary 2 when it departs the shipyard for a 2-night cruise to Southampton, UK. The famous ocean liner will sail a few sailings from the German port across the Atlantic to New York City. All you have to do is do a search on Cruise Hive for Queen Mary 2 and you’ll see all the details on the upcoming changes. Queen Mary 2 is the flagship of the Cunard fleet and entered service in 2003. the huge liner can carry 2,640 passengers at double occupancy and Her Majesty Queen Elizabeth II is the ship’s godmother.